At first, I was a bit nervous about the trip because my Spanish is not very good. However, it’s true that when you lose one sense, such as sight or hearing, your other senses get stronger. In this case, my “loss” of spoken language caused me to rely on body language and intuition. I must say, though, that I felt a great deal of free flowing love and acceptance in Mexico. 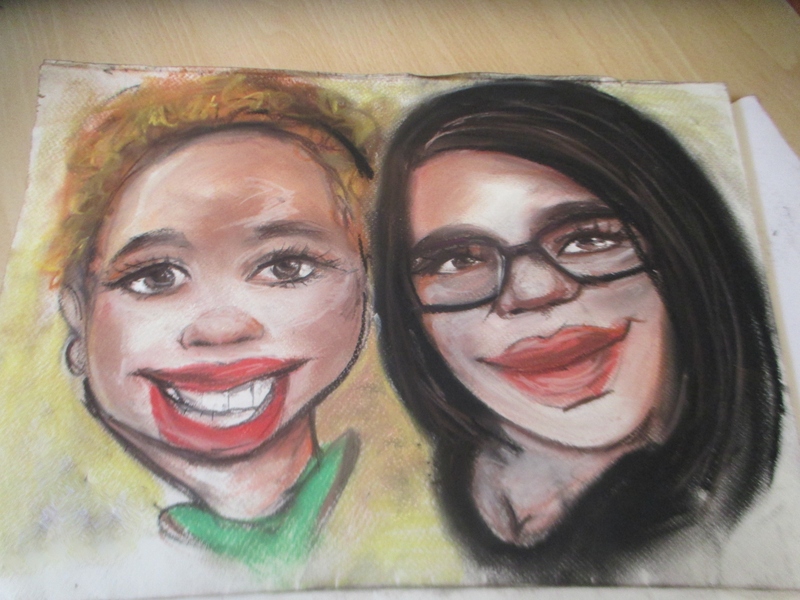 One reason that I like the picture that the street artist drew of me and my daughter is because the positive energy was particularly flowing among the three of us. I think the feeling was captured in the moment and really represents how I felt during the entire trip. To be sure, there is a great deal of poverty in Mexico, which was quite evident in some form or another everywhere we went. But at the same time, there is a strong sense of community. Often, people gravitate to the city center, or zócalo. Many of the large cities in Mexico have a zócalo where there are vendors, street performers, and activities. 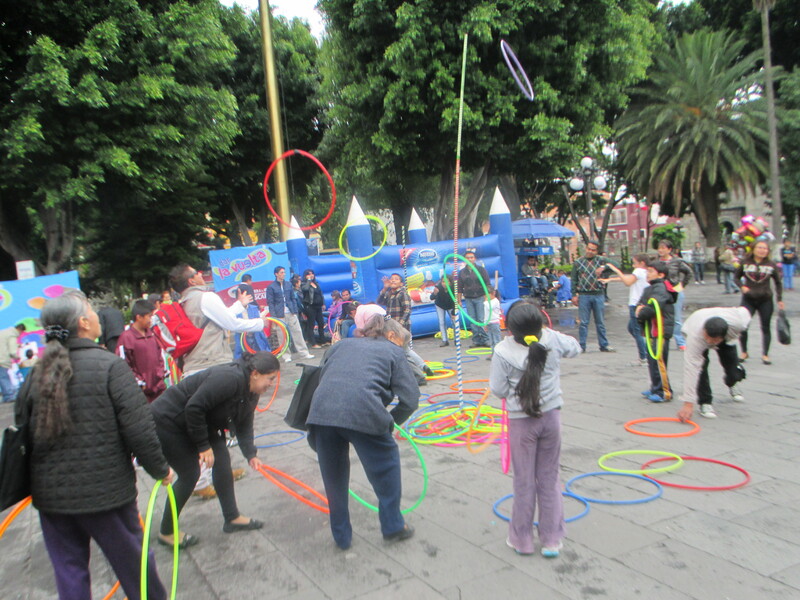 For instance, one Sunday morning in Puebla, men, women, and children of all ages were jumping rope, playing soccer, trying their hand at a ring toss, or just soaking up the atmosphere. It was really beautiful to be in an environment where there was freedom to play and be ourselves. Maybe I hang out in the wrong circles but it just seems that in contrast, Americans are relentlessly goal driven and so uptight that we don’t allow ourselves time to be in the moment. You may know if you’ve been reading this blog for a while that I’m a huge fan of Mexican artist Frida Kahlo (see Polite Conversation, Blog Lovin’ and the Big Reveal, and Poetry as Religion. 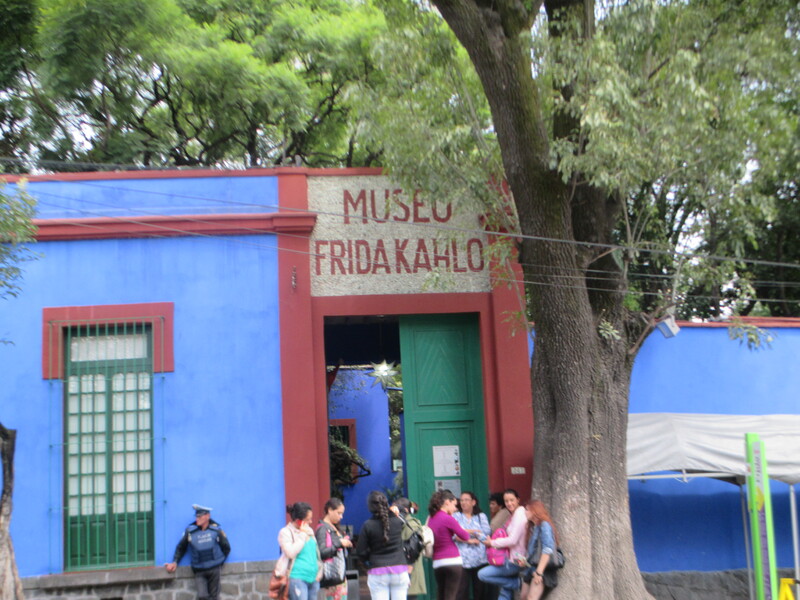 I was so incredibly thrilled to have the opportunity the visit the Frida Kahlo Museum, also called La Casa Azul (the Blue House). This is where Frida was born, lived for a time with her husband and famed painter Diego Rivera, and died. Before stepping into the first room from the courtyard, I had to gather myself because I was so overwhelmed. Unable to express my hesitation to the bemused attendant, I gave him the universal sign of excitement (i.e., clapping and giggling). When I finally was able to walk inside, I sort of stood in the middle of the room and wept for at least five minutes. Fortunately, the other visitors understood this universal sign of goofiness and politely walked around me. Frida Kahlo’s studio, Still Life with Flag (1954) on the easel in the background. The house had artwork by Frida, Diego, and others, though not many of the well-known and spectacular Frida self-portraits. There also were rooms dedicated to Frida’s sense of fashion, which was influenced by her various medical problems. Some rooms of the house were preserved as they were lived, including the kitchen and most remarkably for me Frida’s studio and bedrooms. Most haunting was her deathmask lying on the bed. 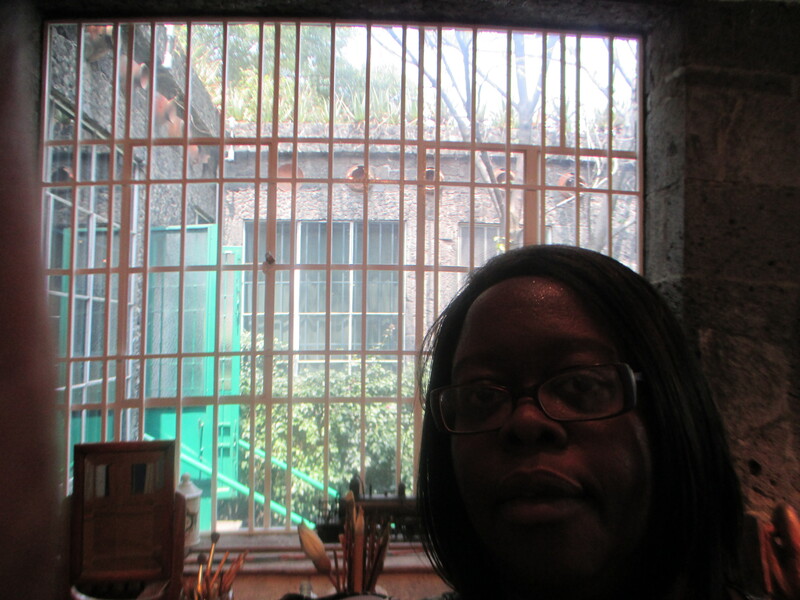 I was traveling on my own that day but I had to take one of myself in Frida’s studio! So much love and energy exuded from La Casa Azul. Both Frida and Diego are beloved and respected figures in Mexico but I believe the warm embracing aura was the legacy of the creative spirit soaked into the walls and floating through the air in the courtyards. 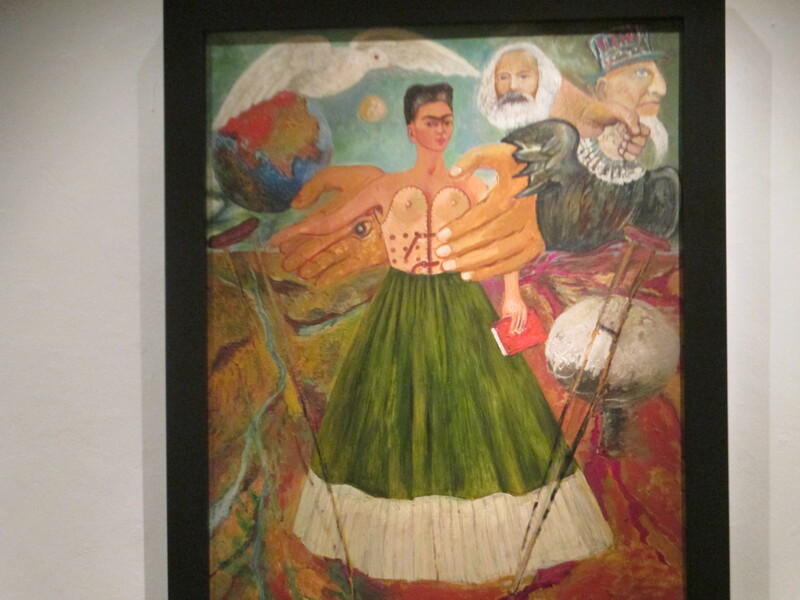 With 25 Frida paintings, the Dolores Olmeda Museum has the most extensive collection in Mexico–usually. 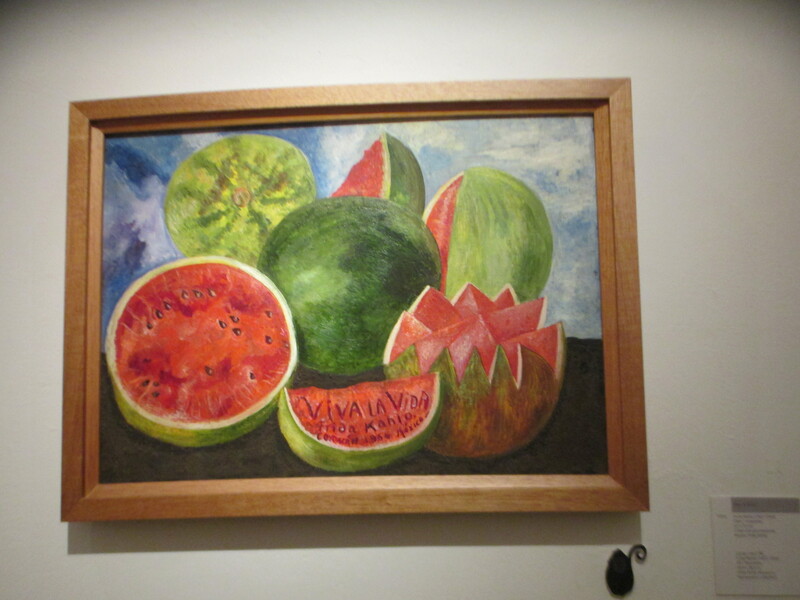 Unfortunately during my stay, the entire Frida collection was touring Canada and France. But the museum is beautiful and opulent, what with peacocks casually strolling around and all, and there was still plenty to see, particulary works from Diego Rivera and José Clemente Orozco. I’ll just have to add this to my agenda for my next visit. 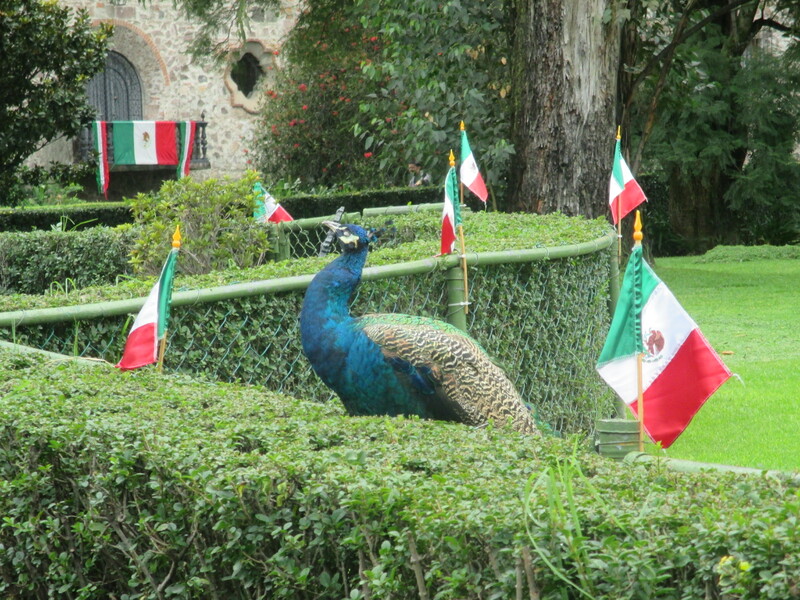 Mexicans love people like you who respond to the many cultural, social, and historic aspects that country has to offer. You hit the nail when you mentioned the strong sense of community vs. the US. The other noticeable feature is that Mexicans smile a lot and seem to be happy even in dire poverty. 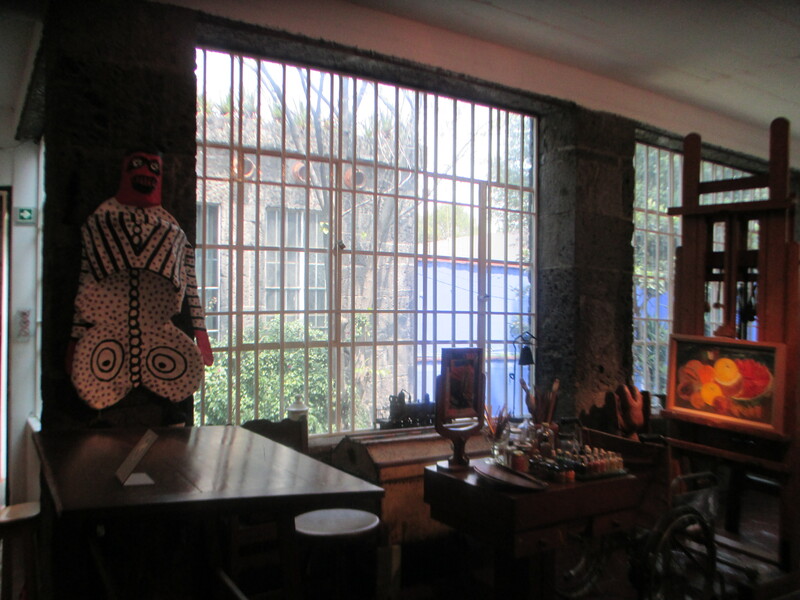 I have been to Frida Kahlo’s home and felt the misery and ecstasy of her existence reflected there. Life for her was grappling with pain but at least she had her creative outlet. In a way, one nourished the other – conjoined twins most of her life. Hope you write more about your visit. This trip sounds amazing! So glad you could spend time with your daughter and see sites you’ve always wanted to. Loved the photos, too. What a wonderful sketch of you and your daughter! The artist certainly captured a special bond and spirit. So glad to know you had a great time! “….Americans are relentlessly goal driven and so uptight that we don’t allow ourselves time to be in the moment.” Coming from India, somewhat culturally similar to Mexico, I struggled with the uptight-ness of Americans. I still do. My hubby who is Indian American, practically raised here is one example-I have to keep reminding him to relax, be in the moment, of the beauty of spontaneity. I read about Kahlo’s museum recently. NYC has or had a show on her works. She is someone I admire so much. I can totally understand your emotional response as you entered the museum. I would too. sounds awesome, Adriene. I love Frida too, I totally understand the overwhelming feeling you experienced, I would have probably been in fetal position. I have never been to Mexico and always wanted to go. It sounds indeed like a great trip. I also find that, sometimes, in poorer countries, people have of course less but are more happy. I love Frida too. There was an exhibition at the Tate modern in London a couple of years ago and you could feel her pain through her paintings. Thanks for this post! Sounds and looks like you had a great trip! I’d love to travel with my mom. 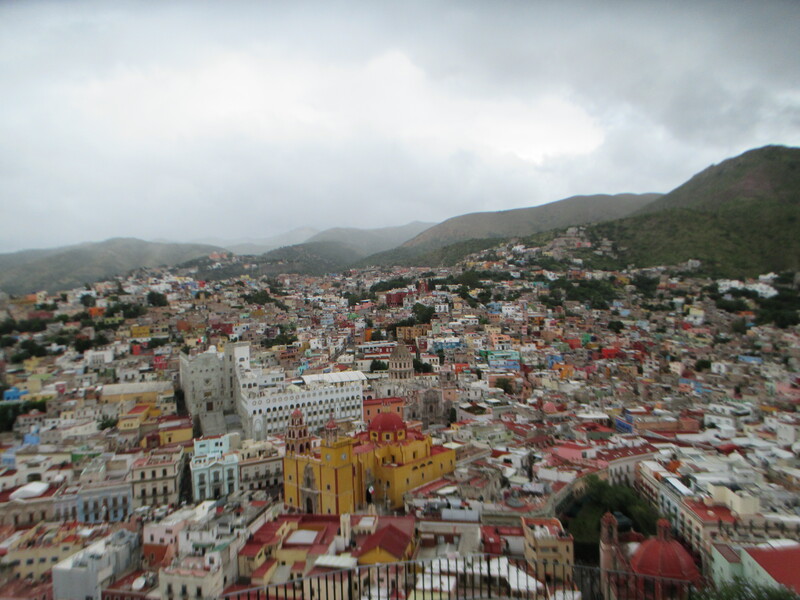 I’ve never been to Mexico – I’ll have to add it to my list! Thanks for sharing about your experience. I hope we can get together soon and you can tell me more! I felt the love in the caricature of you and your daughter. You look so peaceful and in the moment. I hope you can conjure up that feeling anytime you need it. I’m so happy for both of you.